With a large family to cater for, I am forever on the hunt for shortcuts when it comes to hasty but healthy meal preparations. Like many parents and non-parents alike, I find kitchen appliances absolute saviours for surviving the hectic Monday to Friday run, especially during the school term in particular. There's nothing quite like the convenience these modern benchtop marvels offer, especially for throwing together a decent meal with little time or energy at your disposal. 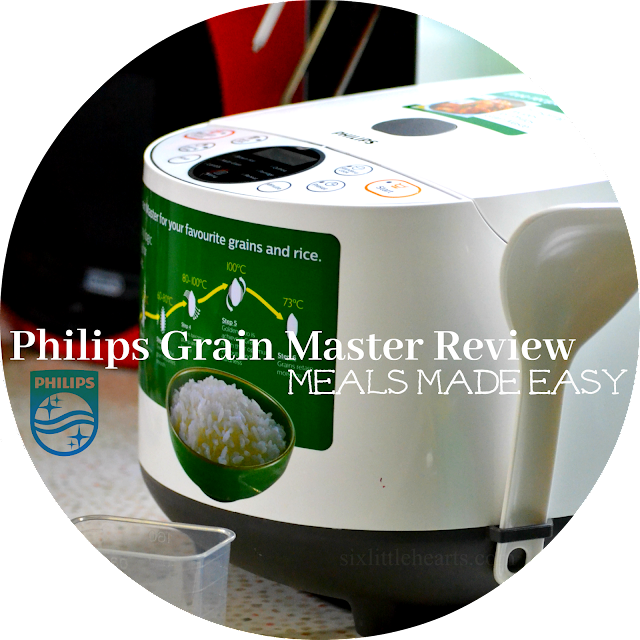 So bearing this in mind, I am more than happy to share the newest kitchen helper in our home - the Philips Grain Master. The Philips Grain Master is more than a standard rice cooker. This versatile appliance cooks many of today's popular foodie grains, from all white rice varieties to brown rice, multi-grains, lentils and even quinoa and porridge. 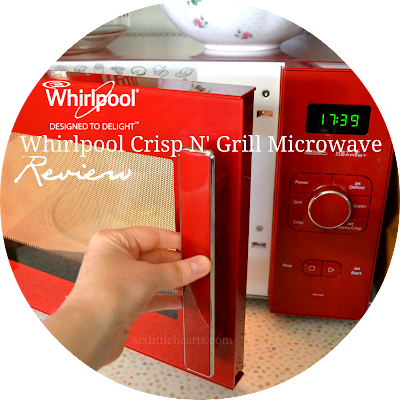 My opinion on this appliance from the minute it was unboxed: It's attractive, easy to use, entirely effortless when it comes to meal preparation and ultimately, it's a time-saving device that's worth its weight ten times over. It has certainly lived up to these impressions during our trial. I don't have to tell you that preparing rice and grains via the traditional absorption method is altogether time consuming and messy. It's something I personally avoid doing unless I know I can spare the time to be non-stop present in the kitchen and keep watch over the whole ghastly process. Since owning the Philips Grain Master however, cooking a grain-based meal has become a whole lot more streamlined and attractive, and that's something I am relieved about to say the least. After all, grains are good for us and essential in human diets. 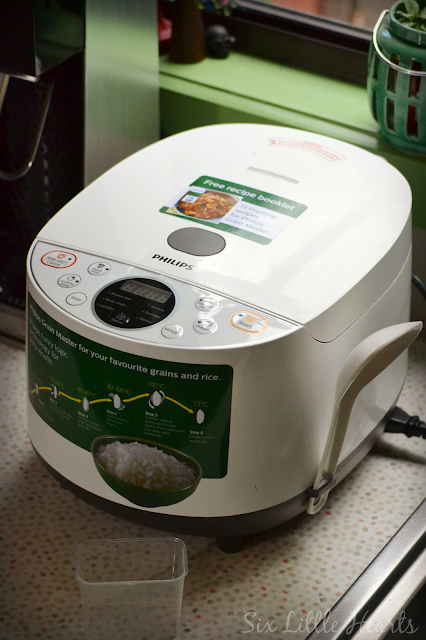 Owning this appliance has meant rice and grains have seen a big come-back in our household. (Great news with the arrival of autumn.) Happily the health benefits and budget savings are enormous for the whole family. 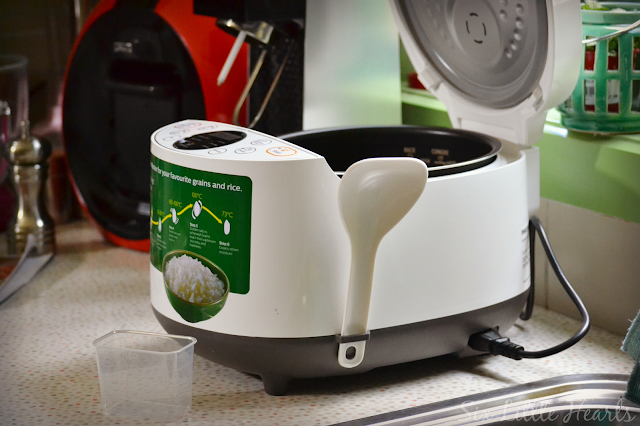 The Philips Grain Master is an everyday appliance that will serve you well. It has eight pre-programmed functions for various grain types that will ensure your meals are always cooked to perfection with the simple press of a button - all while you occupy yourself with more important things. The Philips Grain Master controls the temperature of grains at every stage of the cooking process to enhance moisture absorption. This results in fluffy, individual grains with no clumping or gluggy patches. The Philips Grain Master has a fully detachable inner lid for easy cleaning. The Philips Grain Master comes with everything you need to start cooking from the moment you unbox. 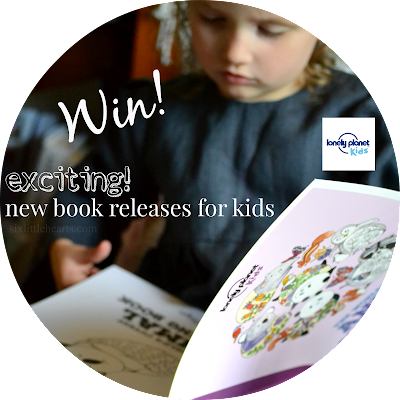 There's a measuring cup specifically for your grains, a ladle for serving (which stores conveniently on the side of the appliance) and a full-colour cook book with a great range of recipes, covering everything from breakfast to dessert options. At a glance, this cook book really gives users a great idea of just what this machine is capable of. You can use it as a guided starting point and reference to get creative with your own meals as your confidence builds further down the track. 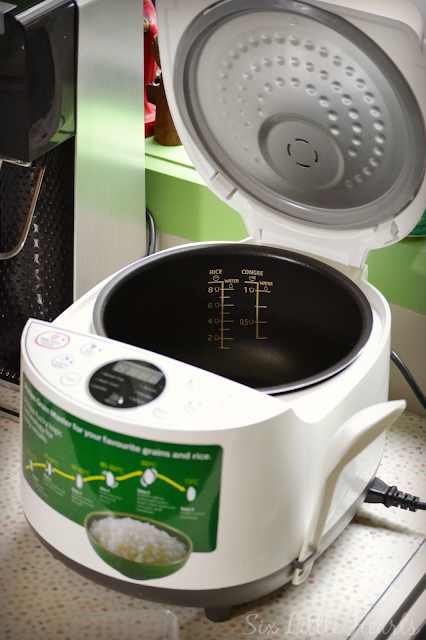 Cooking rice and grains in the Philips Grain Master is so simple. 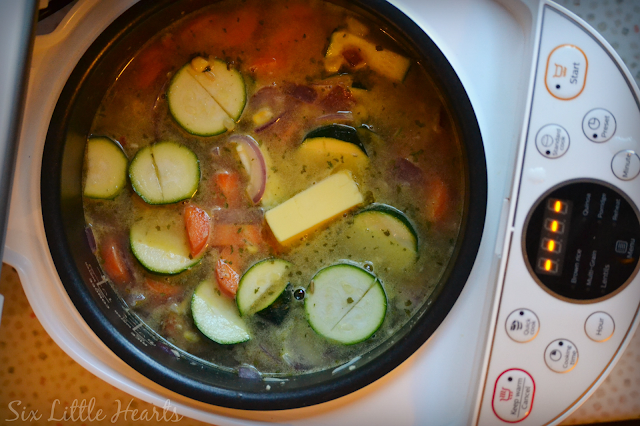 Just place the number of cups of grains you desire into the removable non-stick inner pot. 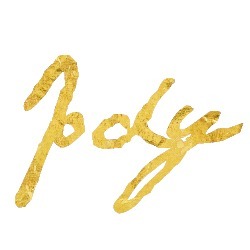 (The 5 layer Crystal Black Pot has a non-stick, anti-scratch coating that is extremely easy to clean.) Then, fill the pot with water up to the fill-line as indicated on the interior of the bowl. 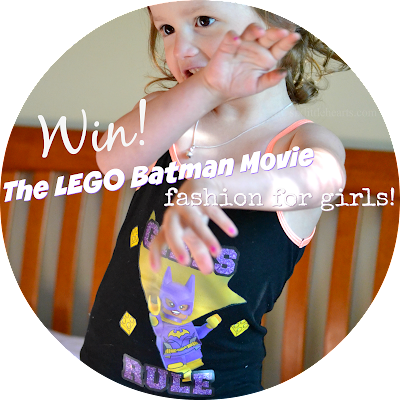 Shut the lid on the appliance and choose your relevant setting by pushing a button and pressing 'Start.' Your grains will be cooked without your intervention from here. The Philips Grain Master will even provide a handy countdown feature and beep at the program's end to let you know when your meal is ready. There's a 24 hour pre-set timer built-in, which means you can set your meals to cook and be ready to eat, when it suits. Think healthy cooked breakfasts to kick-start the day with, or ready-made dinners waiting for you at the other end of a long day. Just bliss - especially in the colder months. At the opposite end of the cooking process is the keep-warm function, which automatically kicks-in at each program's end - for a full 12 hours. This appliance is sooo versatile! Rice on its regular cycle can take 45 minutes to cook using this appliance. 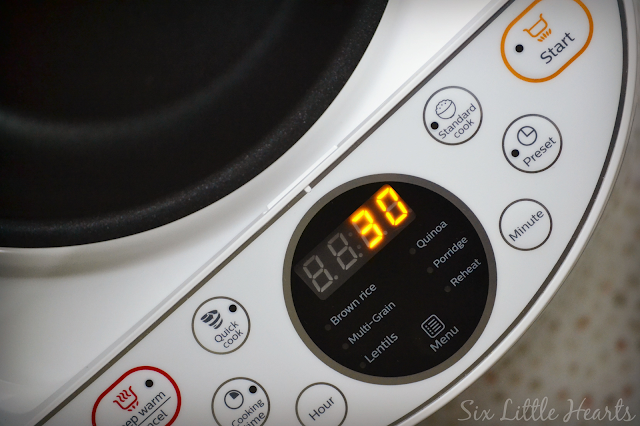 The Philips Grain Master also offers a Quick Cook function, which speeds this process down to 25 minutes. 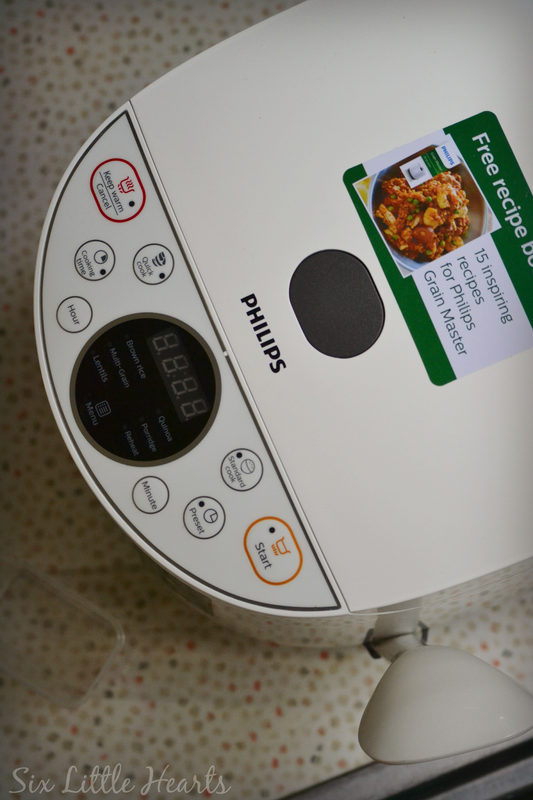 Additionally, the Quick Cook function allows you to heat-through further ingredients, (such as fry onions and seal vegetables), which you can then create into a meal within the Philips Grain Master. This all-in-one functionality makes this cooker a superb way to manage healthy dinners (and all kinds of one-pot meals), quickly and conveniently. Instant meals at the press of a button. The Philips Grain Master has a user-friendly, bright LED panel to work with. We've been putting the Philips Grain Master to the test fairly regularly since the weather has shifted into autumn. Desserts are now a feasible option with the approach of the cooler weather. 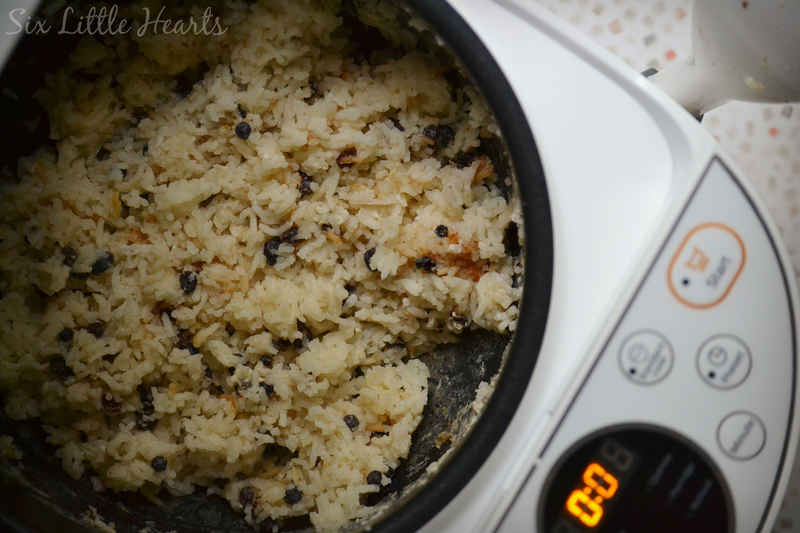 A tasty rice dessert with a Thai twist in only 45 minutes. 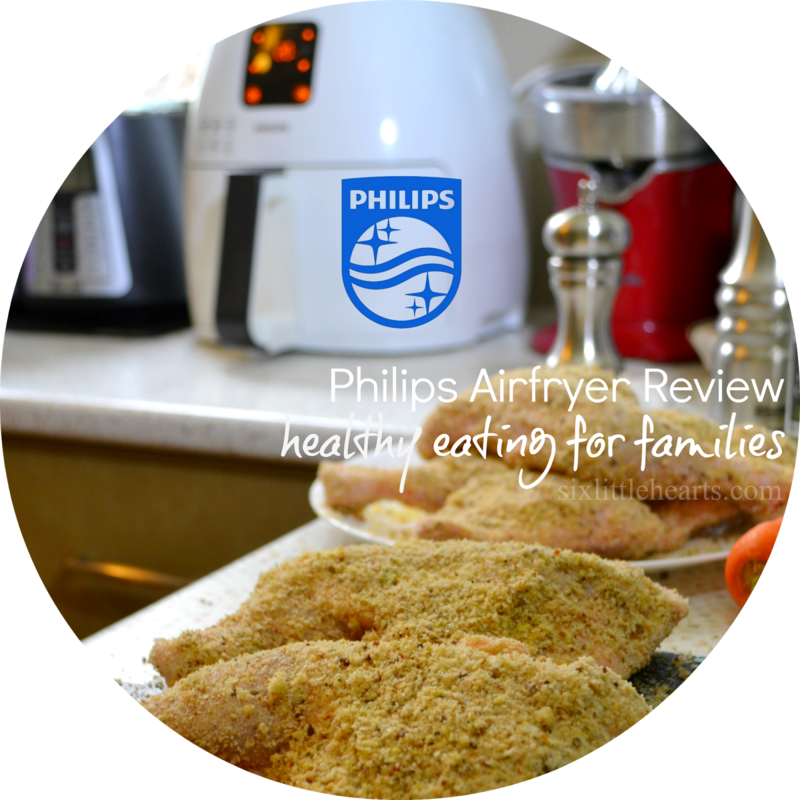 Dinner is far less of an exhausting ritual using the Philips Grain Master too. This creamy, brown rice, vegetarian risotto (pictured below prior to cooking), was so straightforward using this appliance. It's just an idea of one of the many meals you can create with little effort using this appliance. For an easy brown rice risotto, (pictured here prior to cooking), pop everything in the pot, press cook and walk away. The Philips Grain Master will let you know when it's done. Once the vegetables are sealed in the heat, add 2 cups of washed brown rice, 30 grams of unsalted butter and four cups of stock. (Or your favourite brand recipe base for added flair.) Give everything a quick stir and shut the lid of the Philips Grain Master. 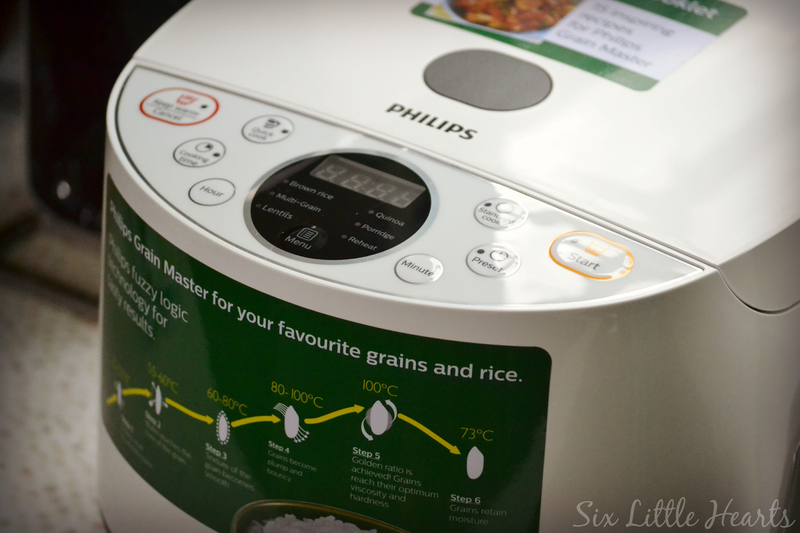 Press the 'Brown Rice' function button, then 'Start' and wait while the Philips Grain Master does the rest. The resulting meal is a creamy and delicious vegetarian risotto cooked beautifully. Serve topped with fresh parmesan and add salt and pepper to taste. The Philips Grain Master is an appliance that is a pleasure to use daily, being both extremely user-friendly and versatile. It is time efficient too, in that there's no pot scrubbing or stove-top cleaning to undertake at the end of your meal. A quick soak and gentle wash by hand, restores your pot like new. Now that we've been fortunate enough to receive one of these fantastic appliances with thanks to Philips, I couldn't imagine life without this in our kitchen. We highly recommend the Philips Grain Master. *Disclosure: Six Little Hearts was gifted a Philips Grain Master in exchange for this feature. 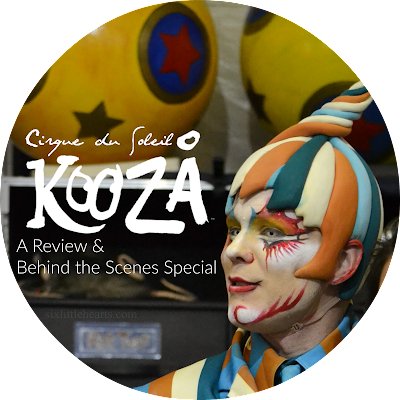 For more specific information or technical queries, please refer to the manufacturer's website. 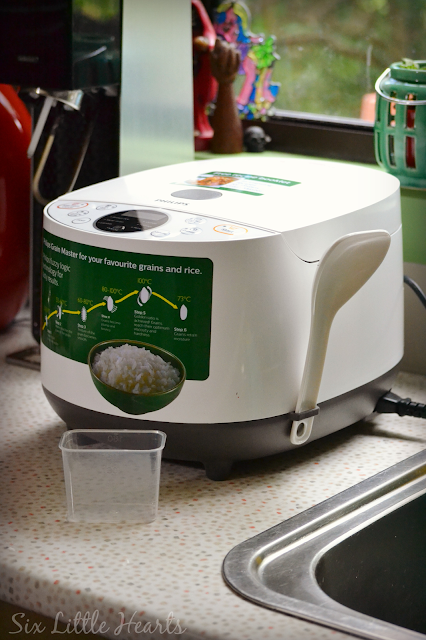 I'm a fan of the microwave rice cooker - perfect rice and it's even travelled with us overseas! 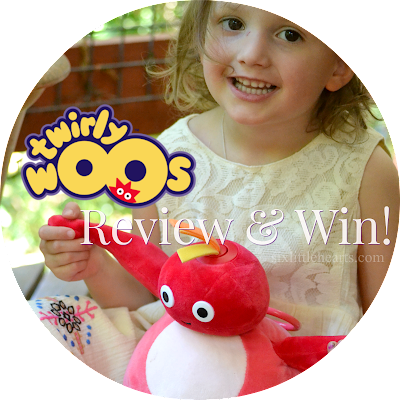 Wow, sounds fab! My rice cooker is on its last gasp actually, so this might be a great idea for our next purchase. I am pretty awful at cooking rice so this is one appliance I probably need. Now that looks useful. I didn't have a rice cooker until February, before that I'd just never make rice because I was awful at it. or I'd buy those "boil in a bag" ones. I'm another one who's terrible at cooking rice, so I'd love one of these. And those recipes look and sound delicious! I've never heard of this machine before but it looks fab. I always cook rice in the Thermomix but this would be ace for lentils and quinoa which I always find a bit tricky. And that rice pudding looks so yum! It's Time to SING Australia!